Who is your favorite #Frozen Character? 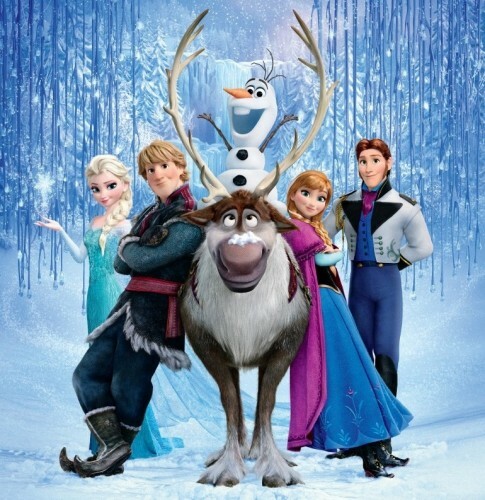 Which of the Characters from the movie Frozen is your favorite? If you haven’t seen the movie, What is your favorite Disney character? Anna is my favorite character. I would have to say Ana. Have seen the movie trailer. Feel in love with Ana. Olaf is my favorite… but Sven comes in at a close second. my girls love this movie. I haven’t seen the movie yet nor have I watched a trailer of the movie so I do not have a favorite character to-date. Sven. I like how he wasn’t a typical character going after the girl, he was a true gentleman and hard working. I love everything about Ana! We liked elsa and olaf. Ana was my daughters favorite. I haven’t seen frozen yet. My favorite Disney character is Sully from Monsters Inc.
Haven’t seen it yet…Belle is my favorite. I haven’t seen Frozen yet, but my daughter is just getting old enough to watch TV. When I was her age. My favorite movie (and character) was Dumbo. My mom said I used to watch it every night to go to sleep. Apparently I didn’t like pink elephants on parade so if she wanted me to go to sleep faster she would fast forward to ten or fifteen minutes before that and I would be out before it started every time. I have not seen Frozen Yet. My favorite Disney Character is Boo from Monsters Inc! Elsa is my favorite Frozen character. Haven’t seen it yet; but, my favorite Disney character is Ariel. I haven’t seen it yet but I can’t imagine my niece will let me go much longer without watching it (a few hundred times!). Olaf is definitely my favorite! I have yet to see it yet. My kids are very excited to see it. I seen frozen ! I love it and I love Olaf!!! Also I love Cinderella! Olaf is definitely my favorite but my 2 yr old daughter loooooooves Minnie Mouse. I have not seen it. My fave Disney character is Captain Jack Sparrow. Haven’t seen it yet. I have always been partial to Cinderella. Elsa is my favorite character! I just got to see it this week – I loved Kristoff and Sven. Haven’t seen frozen. I love Stitch from Lilo and Stitch. I haven’t seen it yet, but they all seem funny from the previews. Elsa, by far the best character of the movie. Anna is our Favorite! We Loved the movie! Thanks for the chance to Win! I haven’t seen Frozen, but my favorite character is tigger!! My son likes the snow monster best, ha ha! My favorite character is Olaf! He is funny but also so sweet. Anna is definitely my favorite! I love Elsa from Frozen, just because she’s such a real person. Its clear she deals with anxiety over having the powers she has, and at first she tries to conceal these feelings. I can definitely relate to that, not because I have powers but because I deal with anxiety on a daily basis. Disney did such a great job with her emotions in this movie. I haven’t seen Frozen yet but, my all time favorite character is Mufasa from The Lion King. Haven’t seen the movie yet but want to soon, thanks! I haven’t seen this movie, although given it’s popularity, I would love to get it to watch with my daughter. My favorite Disney character is Belle, from Beauty and the Beast. I would have to say that though I love both princess Anna and Elsa, my favorite is Elsa. Maybe because I was the first born too. Haven’t seen frozen 🙁 but my favorite Disney character?… There are so many! I have always loved simba! My son’s favorite was Olaf. We’re are pretty keen on most of them, but I think Sven and Olaf are pretty high up. My favorite character is “Olaf”! I have not seen Frozen yet, but from the previews I love Olaf! I love frozen! I love The Elsa!!!! havnt seen it, so i’d have to say Mike from Monster’s inc! I have not seen Frozen yet but can’t wait to!! My favorite Disney character(so far) is Ariel from The Little Mermaid! I haven’t seen Frozen, but I’ve heard great things about it! My favourite Disney character is Cinderella, because she’s such a hard-workin’ gal! Tigger frim Winnie the Pooh, haven’t seen Frozen yet. Haven’t seen it yet. My favorite Disney character is Goofy. I gotta say, I’m an Olaf girl! Olaf, his comical whimsy is a characteristic I used to possess, but I think life slowed it down. Goal: find comical whimsy side of self! Cristoff! Best male lead since Aladdin. I like that Elsa the most. I love Olaf………just love the whole movie!!!! I haven’t seen the movie yet but my favorite Disney character is Flounder. My favorite Disney character is probably Dory (did Disney own Pixar by the time they made Nemo?). I haven’t seen the movie yet, but Olaf looks adorable! I haven’t seen Frozen yet 🙁 But one of my favorite Disney character is Pumba from the Lion King, becuase it is so hard to pick one! I haven’t seen Frozen, but my favorite Disney character is Belle! I haven’t seen it yet !!!! Omg they all have their good sides (spoiler alert: except Hans!) I love how Kristof makes the voices for Sven and Olaf is going to be a (puddle) happy snowman in summertime. Elsa for for “Let it go” (nothing better) and Anna, for being a little bit of all of us. <3 Great movie, Must see! Elsa is my favorite character, but Anna makes me think of my best friend. Haven’t seen it yet, but favorite character would be…Mickey Mouse. Elsa. 🙂 Thanks for the chance! My daughter loves this movie and would love to own it even more. I haven’t seen it yet, but my favorite is probably Belle. My 5 year old says Elsa! Olaf of course and I love love that movie!!! Olaf for sure. The reindeer is a close second. Olaf! I want a snowman like that! I know he’s cheesy, but I couldn’t help loving Olaf. Watching it right now!!! Sven. I don’t know!!! I have yet to see it! I really need to because I hear such great things! My boys and I have got to see this ASAP! I haven’t seen it yet but I love Lady from Lady and the Tramp!